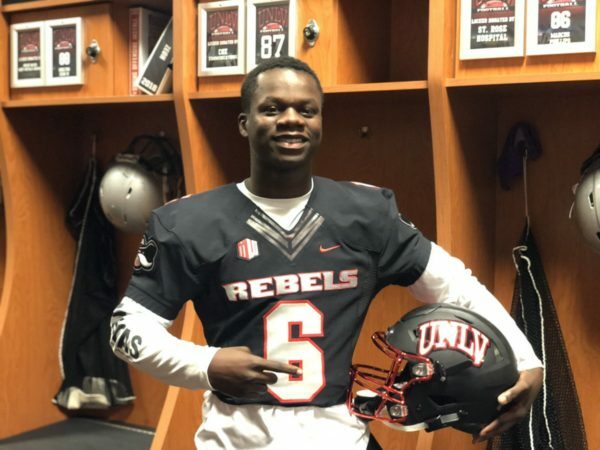 (El Monte) – El Monte running back Davon Booth took an unofficial visit to UNLV last weekend. It should be the first of many college visits for Booth who ran for 2,429 yards last year as a junior (10th in the state) and scored 31 touchdowns. He also accounted for 332 points which was second in the state. Booth is looking forward to a big senior year. 7 Comments to "El Monte’s Booth Visits UNLV"
Beware of the Boobie Miles curse. Go mojo! Is how many other transfers does Coach have ready to come in this summer. Question of the day…does he and C stay at El Monte? 1000s of kids visit schools all spring and Summer, it’s news when it’s an official visit. Whoa, with those numbers Alabama and Clemson will be all over this kid. Aren’t kids only allowed a certain number of trips? Why would he waste one on a school that has no chance? He should transfer to MD.